The Regional Silver Circle Award recognizes individuals who have worked with distinction in the television industry within the Suncoast Region of the State of Florida, the State of Louisiana, the Mobile, Alabama-Pensacola, Florida television market as well as the Commonwealth of Puerto Rico for a quarter of a century or more.The Silver Circle Award recognizes lifetime achievement in television. The award is given to people who are worthy of recognition for the quality of their contribution to television in the Suncoast region. When the award is voted, it is given at the annual EMMY® Awards ceremony. Lissette Campos is the Director of Community Affairs for WFTS-TV, Tampa. 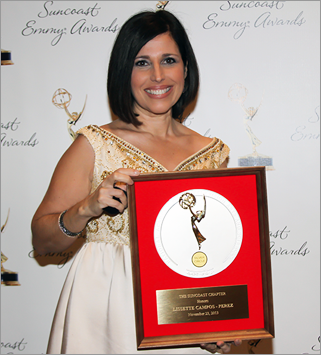 She is a four-time EMMY® award winning journalist with experience in both English and Spanish language television. She began her career at Univision affiliate in Miami, WLTV working her way from video-tape librarian, associate producer, feature reporter to general assignment reporter. In 1993, Lissette joined WFOR-TV, Miami. In 2001, she joined WFTS-TV, Tampa as news anchor of the morning and noon news. She hosted her own franchise “Cuban Connection” and was named 2002’s Hispanic Woman of the Year in Media by Tampa Hispanic Heritage, Inc. Other awards she received were the Society of Professional Journalists Award of Excellence-Mid Florida Chapter and the Multiple Dystrophy Association of America awarded her its Broadcast Journalism Gold Award. From 2005-2008 Lissette continued her career in communications at the University of Florida. In 2008, she returned to WFTS as Director of Community Affairs. Since then she has launched the outreach campaign – Taking Action Against Domestic Violence. She has won numerous awards for the campaign including: EMMY® awards, National Headliner Awards for Public Service Campaign, Regional Green Eyeshade Award and Florida chapter of the Associated Press. Lissette and her husband Angel have two daughters, Sophia and Audrey. Carlos began his career in 1979 at WTVJ, Miami at 18 years of age as a grip. He worked his way up to be a cameraman for the news department. He worked at the Spanish International Network as a photographer/editor in 1983. In 1994 he worked in New York as an editor. He covered the OLYMPICS in Atlanta, Korea, Canada and London. He has worked at NBC Universal in Burbank, CA and has produced, written and edited many documentaries on his native land of Cuba for which he has won many EMMY® awards. Carlos has traveled the world with WTVJ and as a NBC staff photographer working for the Today show and all of the NBC cable networks. Carlos has received many awards including the Associated Press Award, the Scripps Howard Foundation National Journalism Award, a Peabody Award, a duPont Award, the Missouri School of Journalism Award, the Mitchell Wolfson Award, three ACCA Awards, the Acrin Award, the 2001 Silver Angel Award, the Associated Press Award and the United Press International Award. 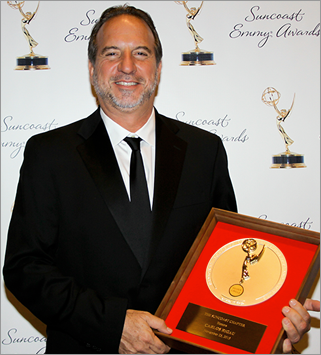 He has received many regional and national EMMY® Awards. Today, his work product is like his life. Fun, straightforward, pristine, unique and heart felt.